“You should frame it,” Maria said. It was a light bulb moment. 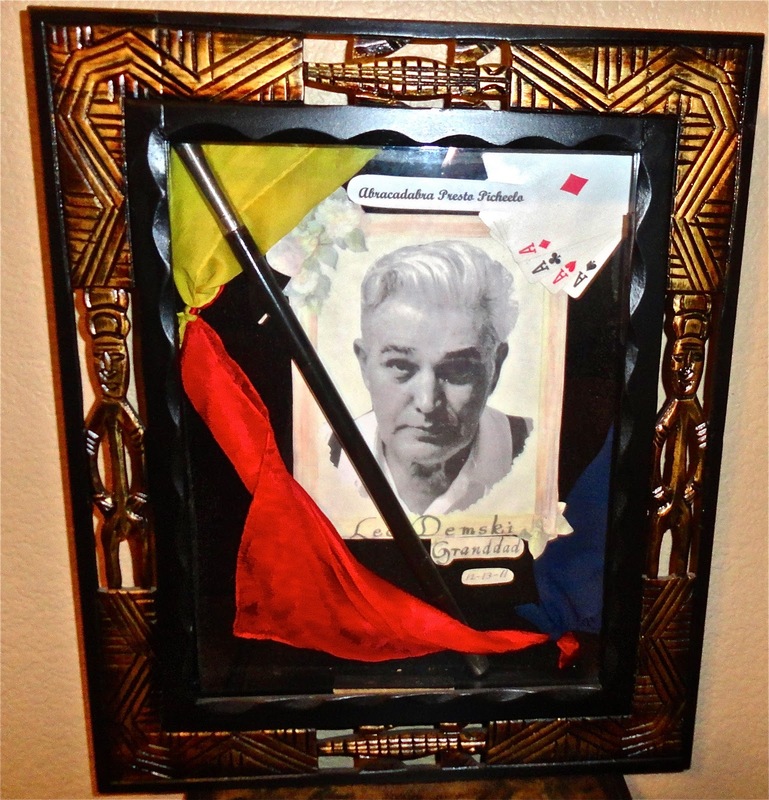 I found a frame, a photo of Granddad, some of the silk scarfs he used, typed up his magic words, “Abracadabra Presto Picheelo,” and added some playing cards. 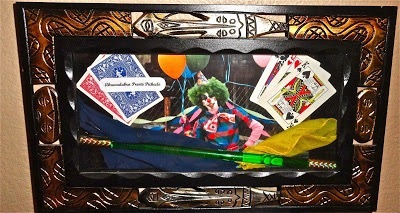 I loved the way it turned out, so I made another one with the magic wand I used many years ago when I tried my hand as a clown magician. I was a clown magician for my son’s 4th birthday party. so it tied in with the other one, and I hung them on the wall together. I bought the frames at Ross at a good price. They had some 3D funky looking plastic figures in them, which I removed. I was on a roll, so I made some more shadow boxes that reflected the Monster Moon books my BBH McChiller co-authors and I were working on. When we’d get together, we’d surprise each other at times with little sourvenirs or dollar store treasures that pertained to things in the story. I had so many trinkets and no more room on my shelves, so I decided to make shadow boxes with them. This one reflects the prankster character, Freddy ‘Hangman’ Gallows. Maria bought these gags at a dollar store. kids go crazy over it and want to know how much it costs to buy it! To read my post about props and school visits, click here. which takes place in a fictitious Old Chinatown near a haunted swampland. Too bad I never took any classes in photography. My reflection in the glass kind of messed up the photo! More Secret of Haunted Bog treasures! This one reflects Vlad’s past. He’s the talking pirate rat in Monster Moon. captures most of the action in Secret of Haunted Bog. Now that I have grandkids, I’ll make some shadow boxes for them one day. I’ll personalize them to reflect some of their favorite things, whether it be a sports team, books, ballet, whatever they’re passionate about. Only time will tell. 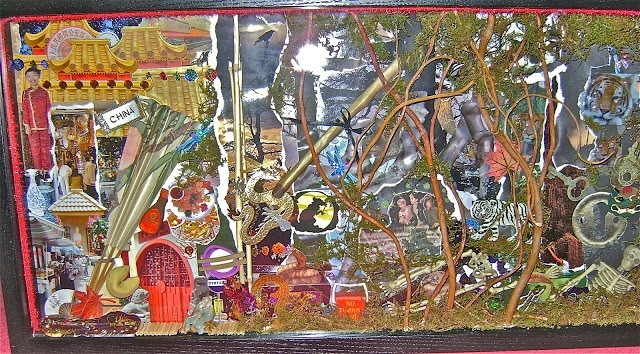 I haven’t made a Christmas or holiday shadow box – yet. Anything might inspire me at any given time. They’re really not hard to make at all, and you can buy the boxes at a craft store. Or keep an eye out for a frame that has enough depth to add 3D objects. So, if you’re crafty and have some special treasures that you want to display or give as a gift, then have at it! If you make a grouping, they sure can dress up a wall. These hang above my desk. on our Monster Moon books while we were working on them. 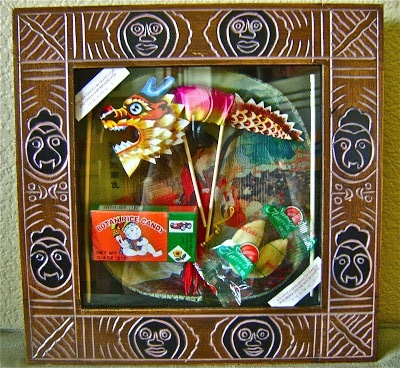 If someone wanted to make a shadow box for you, what would they put in it to reflect the things you’re passionate about? Read about it in her post here. There are a lot of testimonials in the comments section. It’s a two-month class for $40 and well worth it. She knows her stuff! Next class begins in January. 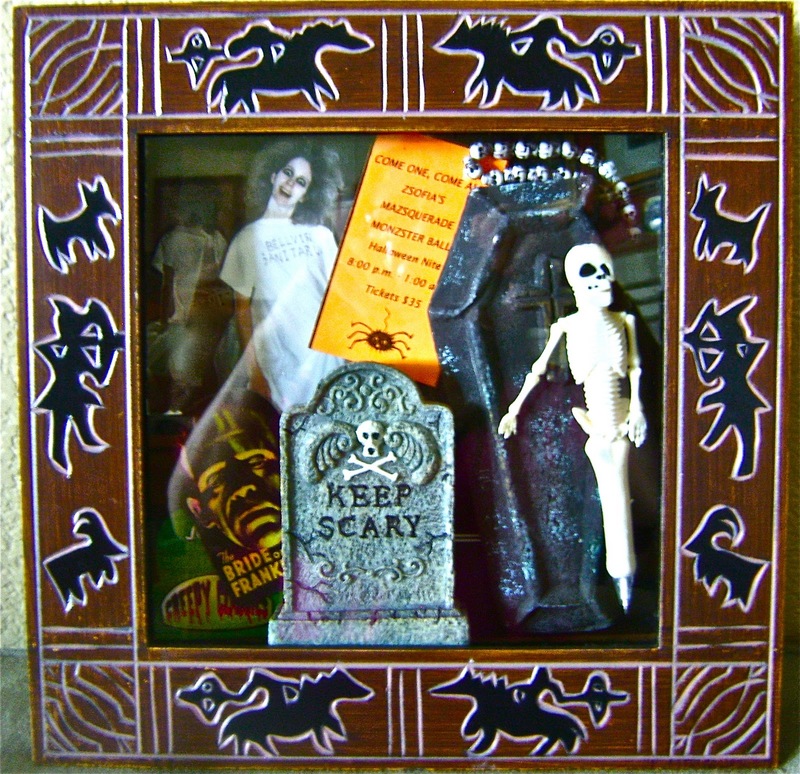 This entry was posted in Arts and Crafts, Curse at Zala Manor, Pirates, Secret of Haunted Bog, shadow boxes and tagged crafts, handmade, magic, magic wand, mementos, shadow boxes, souvenirs. Bookmark the permalink. I've said it before, and I'll say it again, I think you're so talented! I know you say they're not difficult to make, but that's like a professional chef telling me it's easy to make a roast (something else I can't make).All of those shadow boxes are such great mementoes!If someone were to make a shadow box for me, they'd probably include some scenes from New Zealand (I went on holiday there and didn't want to come back), as well as writing bits and pieces. Possibly a stick of RAM too, as I like building computers. I have some items from my wedding, small things, that would go perfect in a shadow box but right now are sitting in a shoebox. Thanks for the great idea. I'll have to rather up what I need in the new year and showcase our memories. How do you have time to blog?Fabulous! You are so creative! Those are fantastic! A very good idea. What a talent! Those boxes are such a delight. You plainly are very artistic. If I thought about it there are probably hundreds of things I could put in one but may be the best would be pictures and mementoes of my children from when they were small babies!! You are so creative in every way…what a wonderful way to keep your memories! Old Kitty – Having a magician grandfather definitely affected my childhood – in a very good way! Thanks!CD – Thank you. I cook my roasts in a crockpot. So simple! 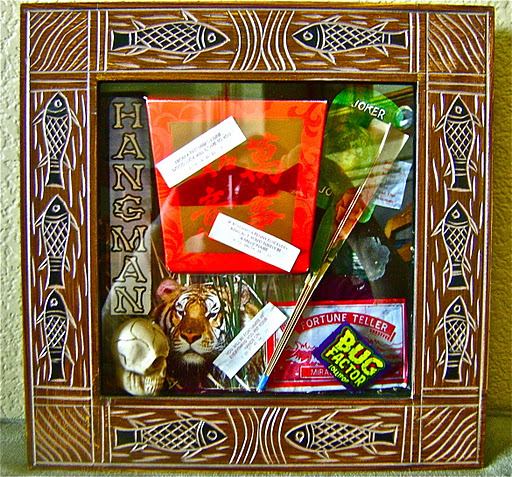 Your items for a personalized shadow box sound very cool. I've never been to NZ. The combo of those items would be very cool. So send my post to your crafty loved ones so they can make one for you! LOL!Marcy – Yes, get those treasures out of that shoebox and display them in a shadow box!April – If you've already made a shadow box, you won't have any trouble making them. If you make one for yourself, you can use items that reflect your novel. That would be very cool to hang on your wall.Susie – Funny that you asked how I have time to blog because when I read your post and saw those beautiful handcrafted cards you design and send out for Christmas, I was wondering the same thing! Your talent is awesome and not something many people can do. Joshua – Thank you. 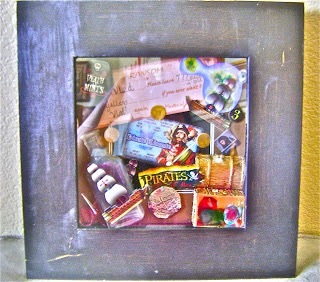 If you make a shadow box, I hope you'll share the results with us!Pat – Thank you for stopping by. 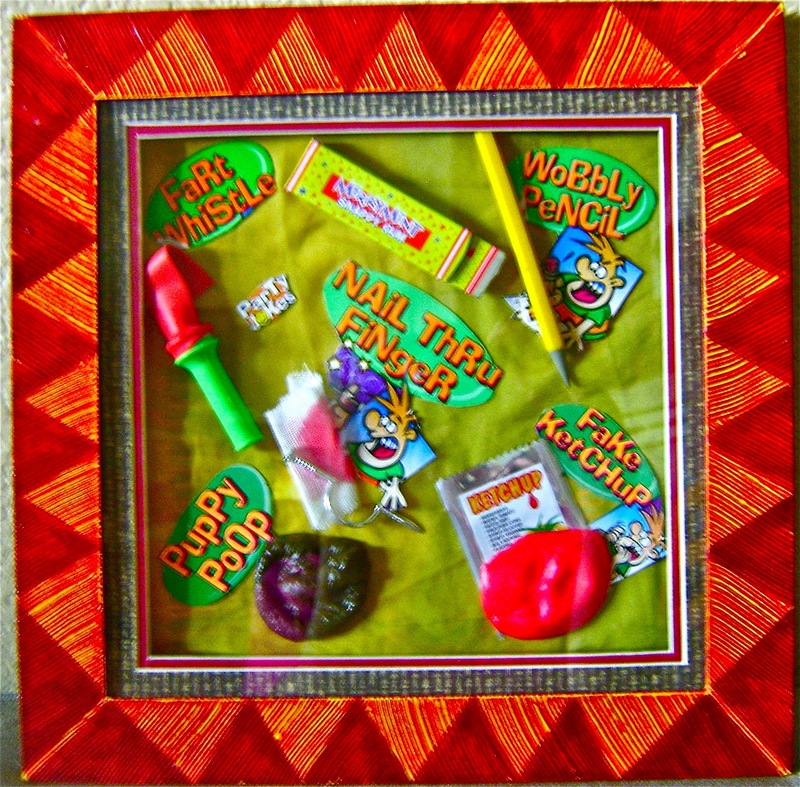 Yes, pictures and mementos of our children make wonderful shadow boxes! The best!Sarah – Yes, all those little treasures your kids made would be great to display in a shadow box!Nutschell – So cool to display your medals in a shadow box. Medals and ribbons, awards, are perfect. Thank you! Such beautiful ideas you have. Why can't there be more people like you?How are you. I am sorry that I have not been in touch with my blogger world. Tough realities of life, plus a different postion than I was used to have been taking their toll. Hopefully I will be back behind the scen soon. OMG, Lynn – these are fabulous!!! I love the idea of arranging the memorabilia in the shadow boxes. Thank you for sharing the photos – I could stare at your shadow boxes for hours. They are so interesting. Wow. Those are really awesome!I did one for my parents after my wedding with some keepsakes in it and a big thank you poem posted inside. They loved it.I'd love to take Kristen's class… she is awesome. I just finished Bob Mayer's online workshop on publishing options… really good! This is really cool and unique. They add a lot of depth of important items. You're amazing, Lynn. 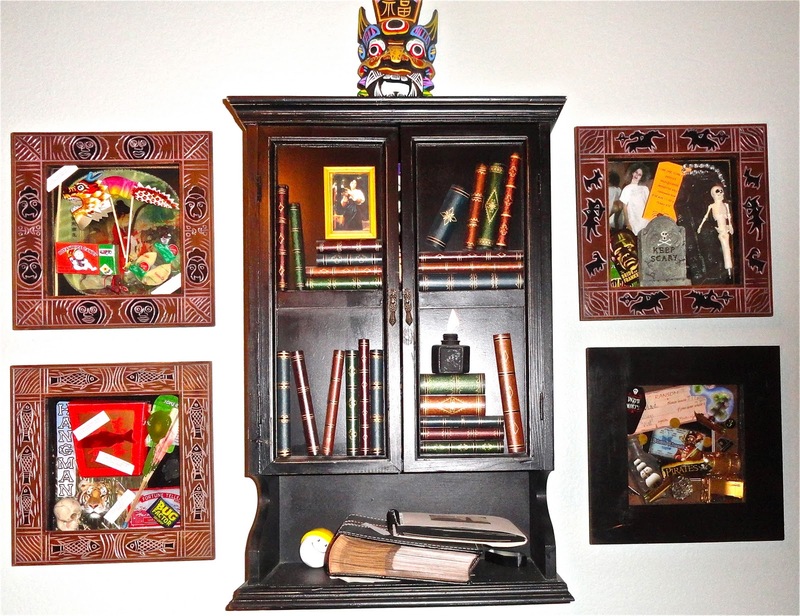 Love your shadowboxes–and the blog's new banner and photo. Under Cover – What a cool idea. I'd love to see how that turned out!Munir – Thanks for the kind words! I hope you get some R&R when the Christmas rush is over and can get back to your other job. Working in heels on your feet all day is rough. Take care!Pk – thank you! That's cool that you made that special shadow box for your mom and dad! You'd like Kristen's class. I hope I'm able to take Bob Mayor's class soon. Can't afford any classes right now, but I know he's awesome.Jenna – Thank you! I'm so glad you stopped by!Pat – Thank you! And thanks for comments on the new banner!